Several weeks ago a friend of mine asked if he could bring a young girl’s horse to my house and work with him because she was having problems catching him in the pasture. She had turned him out in a pasture but he had never been in a large pasture before and they went out to catch him and ran him all over the pasture for, I don’t know how long. Turned out when they got him caught and finally brought him to my place where they could use my round pen to work him, he was lame in his right leg after riding him for a while. Now, I have tried to keep out of the problems they were having but after a while we all took turns feeling the ankle to find any problems and could not feel any heat resulting from injury or swelling. So eventually she called Dr. Stacey Tarr to come out and look at the horse. Now Dr. Tarr is one of the best horse Veterinarians I have ever known and I have known him for years. Now Dr. Tarr checked the horse out and decided he needed to have an X-ray to make a final decision. He suggested resting for a while and then gentle riding. The horse had been in a stall most of his life and only taken out to ride at competitions then put back in the stall. He had never been out on pasture to run free and didn’t know how to handle it. She spent a lot of money having the horse looked at and even a hoof tester that did not show any injury to the internal hoof. Now I am not an expert and do not claim to be a veterinarian but have seen this kind of injury when I was operating a riding stable in the past. I had a horse that got out and we chased the horse trying to catch him a long way. I finally decided we had run the horse too far on hard ground, but the guy helping me kept running the horse and what happened was that the horse had bowed a deep flexor tendon. The horse never did get healed up and had to be destroyed. Now I don’t think this horse had Bowed a Deep Flexor tendon but I do believe he injured the tendon in the long chase and will heal in due time. The horse showed no sign of injury when kept in a pen, only when ridden hard. I do feel like this is a strain on the tendon that will heal in time. I have entered a drawing from the “Horse Science Instructors Manual” so you can look at the lower front leg of a horse and understand the function of the leg. 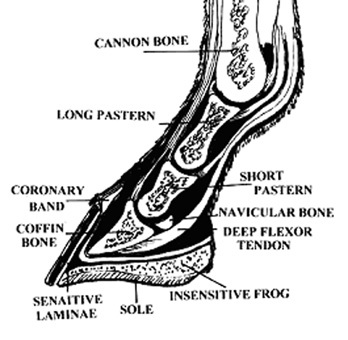 The most complicated part of a horse’s leg is below the knee and subjected to the most injuries.